Thank goodness for FNSI! 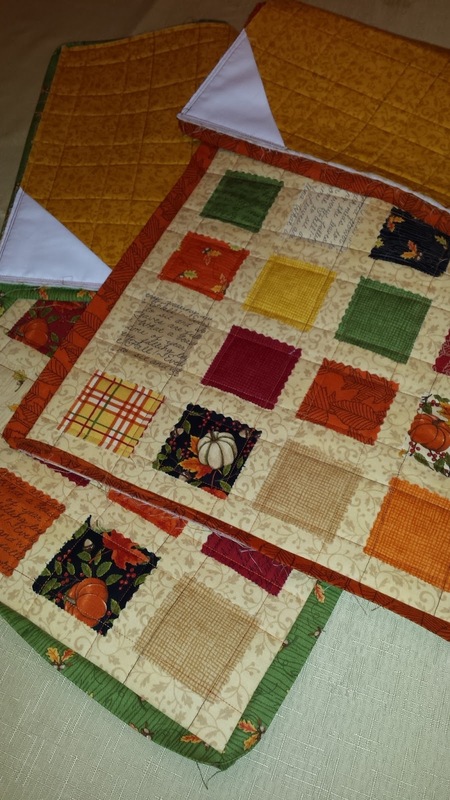 Finished the quilting on the last table runner and got labels & bindings attached to both. Only the final hand sewing on these left to do! They'll be gifted out before we know it! Since I was going strong and the space heater had my basement sewing nook warmed up, I figured I should keep that pedal pushing! Sewed up these two pillowcases. Love the "miracle" of the Burrito Pillowcase! Anyway, see the "Forever Sisters" written on the fabric? I made these for my twin nieces. Even though they're 17 years old, I think they'll love them! 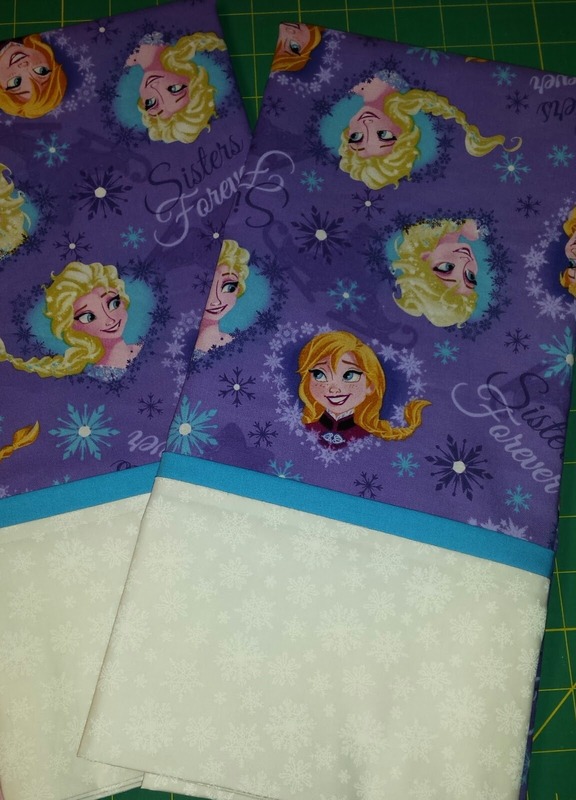 I've got more "Frozen" fabric ... need to whip up a few more pillowcases! I hope everyone that participated in FNSI got a lot accomplished. It's a very busy time of year and we surely need a little breathing room as a treat for ourselves. On a side note, the applique group that I belong to met this morning. There were some beautiful Mosaic projects making great progress. My poor Mosaic hasn't left the tote that I brought it home from class in! So pathetic! 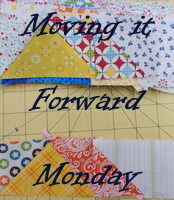 That, my friends, is ONE of my New Years Resolutions: Make more time for applique!!! No time for much except announcing that tonight is Friday Night Sew-In! 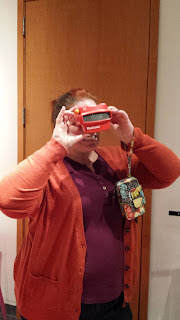 Get yourselves checked in HERE then get to your sewing room and sew, sew, sew!!!! Special thank you to Wendy for keeping us organized and putting together a chance for a gift! Not sure what I'll be working on just yet, probably Christmas. How about you? Wow! I've got a lot to share today! Sit back and see my promised finishes! 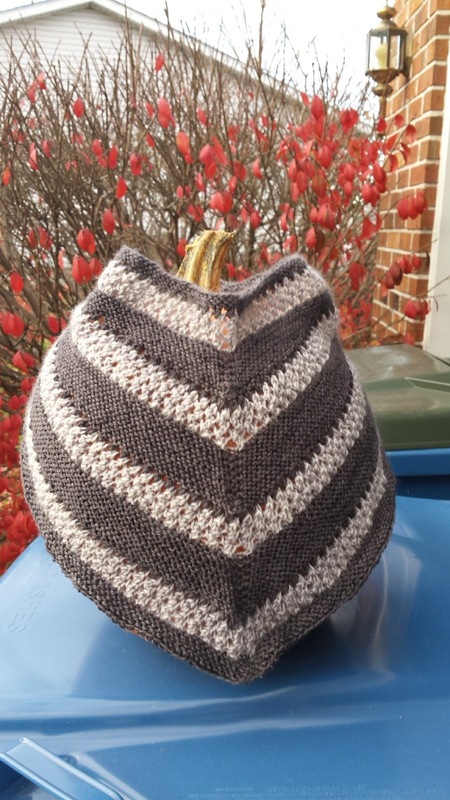 My absolute favorite cowl! It's being gifted for Christmas and I'm almost done with a 2nd one. I swapped out the colors on it and it's looking gorgeous too! 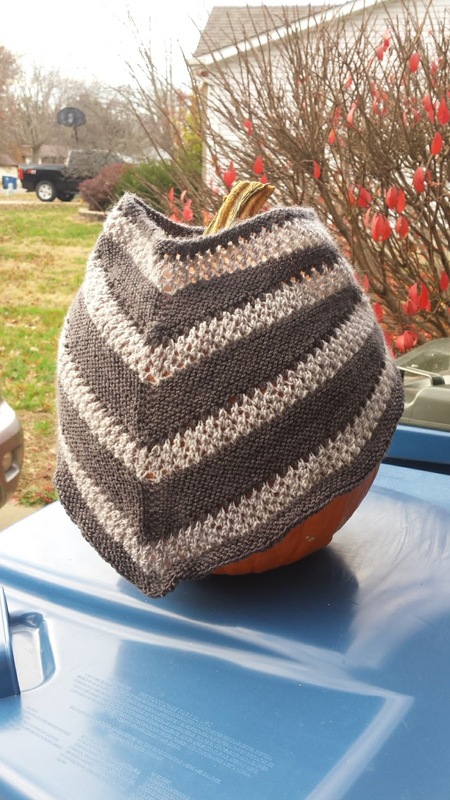 The pattern is Lophelia by Laura Aylor. You can find the pattern Right Here! It's actually an easy pattern to knit. 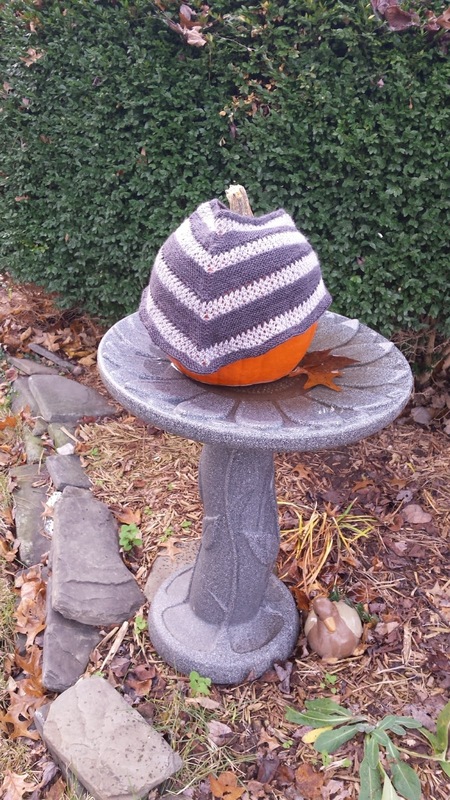 You just need to know how to knit short rows! Brilliant! 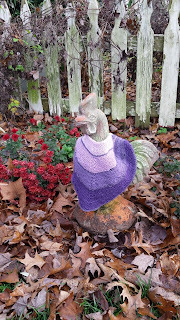 Check out my handsome rooster! 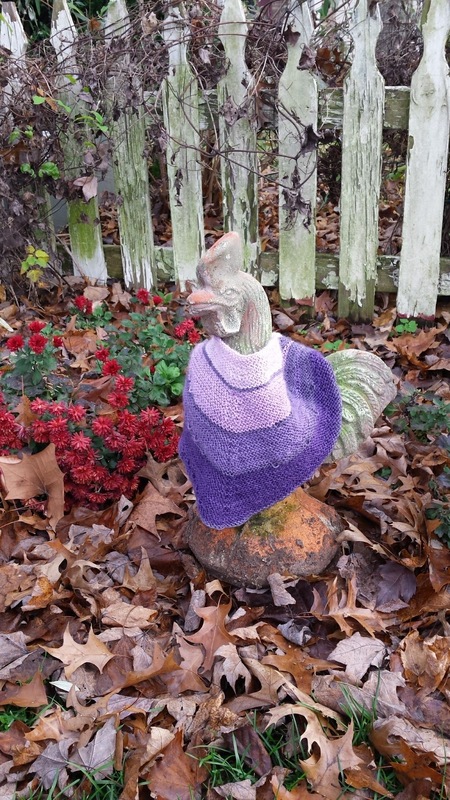 Isn't he sporty in a Thorne cowl, pattern also by Laura Aylor. This pattern can be found Over Here! You may have guessed by now that I was participating in a Cowl-a-Thon sponsored by Laura on Ravelry. It was so fun to see what others were creating at the same time. All so beautiful! In future, I plan on joining other Laur-a-thons. She is incredibly talented! You may remember this was a guild challenge. It needs finishing. 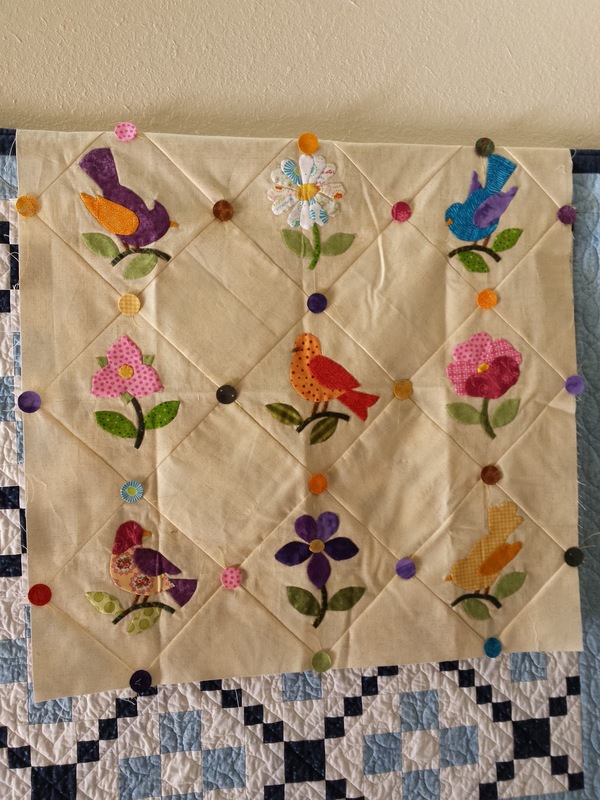 I seem to remember that I wanted to make a scalloped bordered on it. However, Christmas will be getting in the way for sewing UFOs this month. I think this one will be making a return to the list for 2017! Speaking of UFO Challenge 2017, you can get all the details HERE . 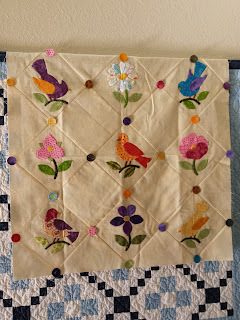 You will find the link for the Challenge Project Sheet and another link for the Facebook group to share your finishes. It's great incentive for progress all year long. Who knows? Maybe you'll finish a few project too -- like me! On a personal note, my daughter came in from Alexandria, Virginia for the Thanksgiving holiday. We enjoyed "Moana" at the movie theater. Reminded us of the five years we spent in Hawaii but we agreed that it was based a little more on Tahitian or Maorian (is that a word?) heritage rather than Hawaiian. We also spent an afternoon at the St. Louis History Museum*, which I didn't even know existed. It was fabulous! We enjoyed all of the exhibits -- Toy, Route 66, and the St. Louis World's Fair. Sarah had just read a book that had some of the history of the St. Louis World's Fair in it so she thoroughly enjoyed it. Me? I fell in love with the building itself! The ceilings are spectacular. Love! *Side note: The museum was FREE, as was parking! Score! 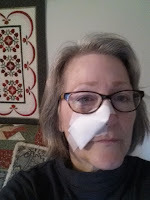 On the day before Thanksgiving I had the Mohs surgery done on my nose, right nostril to be precise. Sarah stayed home to bake the pumpkin pie while Fred took me over to SLU for my 7:30am appointment. UGH! 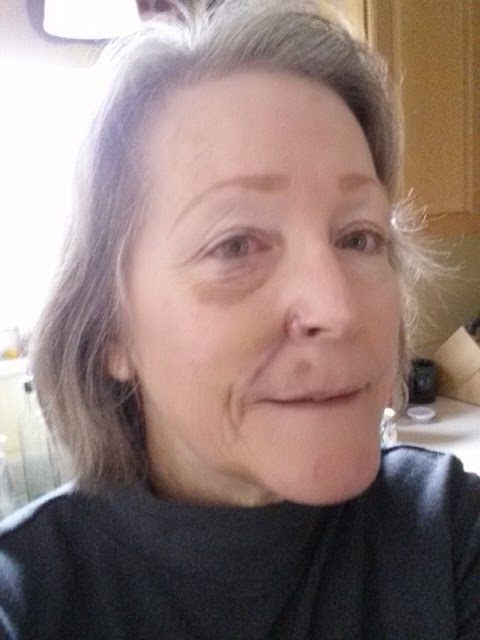 I came home looking like the picture on the right. Not too bad. Today is ten days since. While a lot of the swelling has subsided and the bruising is looking more green & yellow than purple, my eye continues to blacken. 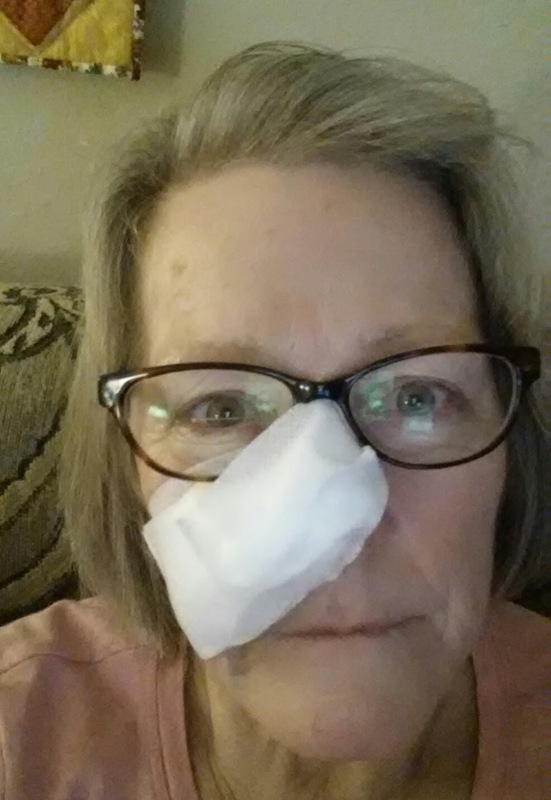 Stitches come out this Wednesday. Trying to decide: Should I bring a stud earring with me so that, when the stitch through my nostril comes out, I can stick the earring there as a wonderful reminder of this procedure and so that I may be more like my daughter?? Nope, I don't think so .... Haha! 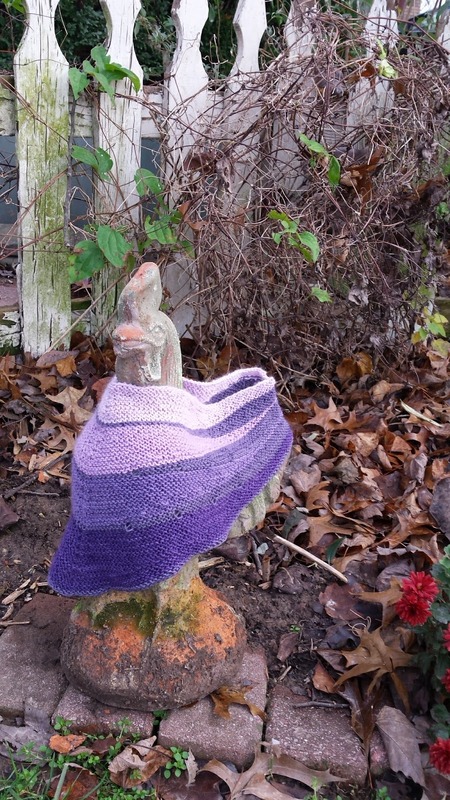 I just had to share on last picture of the Lophelia cowl.